At the beginning of the month, I had the lovely privilege of teaching at my church's monthly women's gathering. I hemmed and hawed (in my own brain) for awhile before accepting this invitation...and then I hemmed and hawed before the Lord because I was absolutely sure there was no way He had anything fresh FOR me, let alone for me to share. Whatever, self. Of course, I was wrong. He let me experience a fresh brush of His presence and might in the place I least expected and was least likely to look for Him: on the couch, in the middle of the night, when a stomach bug had ravaged our home. By later that afternoon we knew it would be a family affair. Weak, but the worst of it seeming to be over, I crept from the bed to help the mister set up our 5 year old on the couch with all the supplies. I tried to keep the baby out of everyone's face (FUTILITY) and administered cool rags and a bucket and sympathy alternately to my daughter and, within a few hours, also my husband. It was the pits, you guys. At about 10pm, as my husband tried to sleep and my daughter slept fitfully on the couch, I texted several friends to pray and I myself began to pray silently: Dear Father - if you have ever listened to a prayer, could you please, please grant me this - don't let the baby get sick! Let him sleep through the night peacefully and wake cheerily. I cannot - CANNOT - go back and forth between two kids who are sick. I will just not be able. And my brain whispered slyly this response: "Don't get your hopes up, because God doesn't usually say 'yes' to these sorts of requests - he's not all that interested in your daily experience, now is he?" I sat briefly in that thought, frustrated and suspicious. And as I sat in that silence, facing my own lie, the voice of the spirit of God filled me from within as He said quietly but firmly: YOU HAVE A VERY SMALL VIEW OF WHAT MY LIFE IN YOU CAN ACCOMPLISH. A beat went by and suddenly, I saw so many whispered prayers that had left my mouth over the years: prayers largely for my comfort, for my preferences to be satisfied, for my hurts to go away, for my way to be made EASY…prayers that God do things my way, according to my earnest expectations and hope that I be exempt from pain. I admit I did not want God to put my confession to the test, but in the wee small hours when my baby son did, in fact, get sick, I saw that Christ’s life in me was truly enough to meet the needs of my family. In this comparatively very small thing of a stomach bug, God began to show me again the very BIG thing of His life in me. I’m not sure I’d ever heard Him impress on me the truth of His presence in those exact words, but I know this is not the first time God has used my circumstances to reorient me to a greater reality. A reality greater than my circumstances. A SPIRIT reality. It made me think of Paul, writing to the Colossians to remind them that "YOU. HAVE. DIED. and your life is hidden with Christ in God" (3:3, emphasis mine). These days of small kids and sickness and midnight wakings and 3am scary dreams and homeschooling and ministering and wrestling with my own thoughts...I am beginning to understand that when I take such a small view of God, I am limiting my living. When I forget that I have died, I begin to believe that my bootstraps are all I've got -- well, bootstraps and diffusing peppermint and wild orange in the mornings to perk me up. When I forget I have died and that "the life I now life in the flesh, I live by faith in the Son of God who loved me and gave Himself for me", I lose the strength and energy available to me to walk by faith and not by sight. I am forfeiting so much life, when I forget that it is Christ's life in me, to will and to work according to His good pleasure. And so in these days I am practicing the daily confession, "Not I, but Christ." When the kids are really loud before my coffee is ready, "not I, but Christ" can attend to their needs. When the husband needs help solving a problem that just really seems inconveniently timed, "not I, but Christ" can offer help. 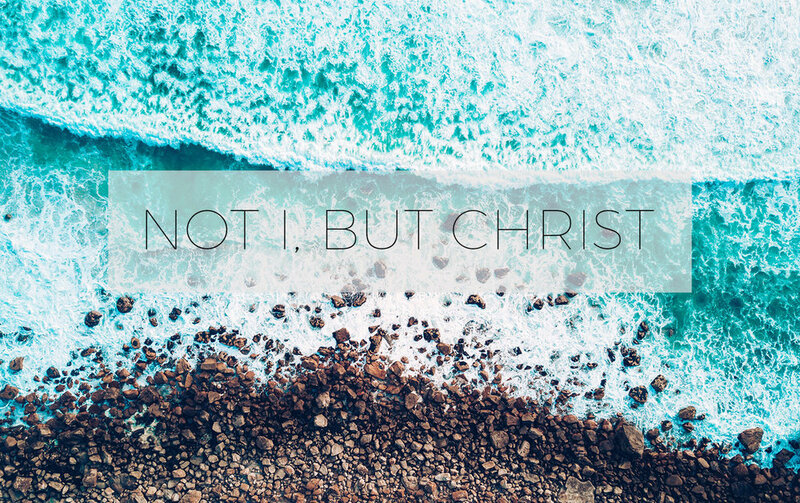 When my own thoughts are in opposition to what I have come to believe is true of God, "not I, but Christ" meets me in that moment and reorients me to His words of hope and peace. It is of course a discipline. And the confession doesn't always make me feel better in the moment. But I am learning that to take a larger view of the life of Christ in me also means that I release the demand that my sensory experience validate the holy truths of Scripture and the words of the Holy Spirit to me. But, you know what? It is right.